We talk a lot about becoming more deliberate and serious about growing our own food. At different seasons, we’ve done better than others. 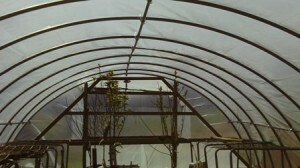 This year we completed the task of putting up the greenhouse. It took us a long time, but finally, I can look out my front window and see a semi-circle of plastic sitting in my side yard. To me, it’s beautiful and thrilling and exciting to look at. It’s also countless hours of work and lots of sweat to actually make it do something useful. Like a lot of things on the farm, most people don’t see the hard work, sweat and tears that go into living on the farm. They see the pretty picture of the cute little farm house with the cute picket fence and the sun peaking over the hill with the rooster crowing in the barn loft. There are no cow patties and flies in that picture and no authentic farm smells wafting from the picture frame. In real life, there are 5 roosters crowing at 2 am outside your bedroom window. That’s real life. The pretty farm picture is an illusion. Farm life is not easy for us…I still go to Costco regularly. My only escape, within reasonable driving distance, is to the local Sonic for a large iced caramel latte…easy on the ice. It gives me a brief reprieve from the grueling hot day when the pig busted out of his pen and ate half of my garden and the cow jumped the fence and trampled my herb patch and the chickens ate all my strawberries. It took hours and days and weeks of planning, preparing and planting and seconds to pluck it up. I had to repent for coveting my neighbor’s weed-free-large-healthy-thriving- garden. My 10 year old reassured me it’s probably a GMO garden that’s been sprayed with lots of cancer causing chemicals anyway. That made me feel better. At least my garden is “a la naturale” with a wide array of thriving weeds to prove it. It’s God who blesses the fruit of the ground lest we think it is all our work and effort that sprouts the plants and grows the fruit. It truly is a miracle. I’m awed and amazed at the entire process. It’s amazing to watch that tiny seed grow into a beautiful plant that provides food to nourish our bodies! Sweat and toil do not always equal thriving gardens and abundant fruit. Sometimes we sweat and toil just because. When things don’t work out like you planned, it’s an opportunity to find your peace and rest in the Lord..who is the perfect Creator and only sustainer of life. Contentment always brings real peace to the soul despite the circumstances. Be thankful for what you do have. We’re rejoicing at every flowering plant and every new sprout that pops up. I should remember to re-read my own blog and take my own advice sometimes. Last year I solved the weed problems with hay mulching. Wow.. great idea! I’m sure there are other lessons from this experience still yet to be discovered. I am thankful for my little, disorganized garden plot. I’m thrilled that this year it has given me the opportunity to reexamine my expectations and allow me to grow in areas that I didn’t want to grow in. That’s the thing about farm life. It’s always a fertile field of valuable lessons out here. Each season brings new challenges when tending living things, children, gardens, animals. All are unpredictable, but each brings the opportunity to find joy in the work we do to manage the tasks at hand. Even weeds although not usually where we want them to be have beauty. Garden pests just need to have something to eat, so we plant things at times not in their life cycle. We have found for example, that if we plant corn and green beans in mid to late summer, the bugs leave them alone. Of course the weather throws a wrench into the best planned gardening tasks, but the unpredictable nature of raising living things is part of the wonder. Great thoughts, Cathy!!! Thanks for offering this advice! You just made me feel a whole lot better about my failures this season. Amen sister! I second all of that! Well-said, Bethany! All your learning points are so true. I’m especially liking #6!